Syria's once notoriously weak and degraded air defense system is now heavily fortified with Russia's lethal anti-aircraft system but it is hardly the "ring of steel" that Moscow has touted, according to several national security experts deeply familiar with its vulnerabilities. As President Trump and top members of his national security team move closer to executing a military strike on Syria, the country's ability to shoot down/intercept U.S. missiles will play a key role in its success or failure, especially if the goal is to take out Syrian President Assad's air force, one option under serious consideration. Russian officials have boasted that its highly advanced S-400 missile system, which is strategically deployed in Syria, would simply shoot down any U.S. missiles fired at Syria. Officials also signaled that Moscow would dramatically escalate the fight by targeting the U.S. source of the missiles. "If there is a strike by the Americans, then…the missiles will be down, and the source of the missiles targeted," Alexander Zasypkin, Russia's ambassador to Lebanon told Hezbollah’s Al-Manar TV station. He said he was referencing prior statements by Russian President Putin and the Russian armed forces chief of staff. Several U.S. national security experts said that even though the S-300 and 400 missile defenses are quite formidable, there are technical limits to them and other elements of Syria's tiered anti-aircraft system that make it impossible to impenetrably defend key Syrian and Russian air bases. "It’s not like there's some iron shield around Syria—that's just silly. It's not how air defense systems work," said Kenneth Pollack, a Middle East political and military affairs expert at the American Enterprise Institute. Even though the Russian anti-aircraft systems are very sophisticated, they can be targeted in missile and bombing campaigns or other operations, he said, cautioning that he did not think the United States would decide to do so because it would escalate tensions with Russia directly. "I don’t think we're going to destroy the S-400s themselves—those are Russian systems so I doubt we want to go after them," he said. 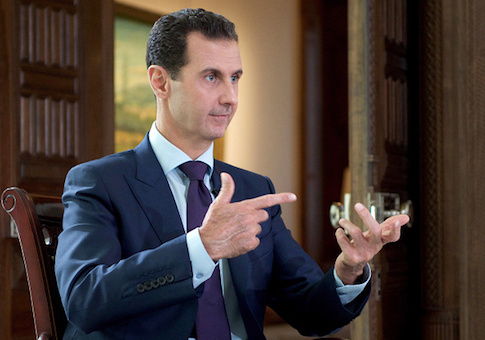 "We're trying to punish Assad, not the Russians." A major contingent of these air defenses are positioned to defend Hmeimim air base south of Latakia, which is also home to Moscow's air contingent. Michael Pregent, Middle East fellow and analyst at the Hudson Institute, argues that Syria's Russian-backed air defense system won't be able to defend against a U.S. assault of hundreds of cruise missiles because its anti-aircraft missile systems can only target a maximum of 36 U.S. missiles at a time and take 40 minutes to reload. During those 40 minutes it would take to re-load, the Russian airbases, where a large portion of Syrian aircraft likely are also located, would be vulnerable to attack. The S-400 systems are also designed to hit high-altitude missiles, not the volley of low-flying cruise missiles the United States is likely to launch. "The calculation is not worth them firing all their rockets," Pregent said. "They might fire some—but they have to worry about the 40-minute window to reload and where you're vulnerable." The economy of force, a basic principle of war-fighting, is standard practice, Pregent added. "You don’t deplete because you can't defend, and 40 minutes is a very vulnerable window," he argued. It is also clear from Israel's suspected deadly missile strike on the T4 airbase near the city of Homs on Sunday that the air defense system are not protecting all of Assad's air bases. It is unclear how many aircrafts were destroyed in that missile strike that reportedly killed 14 people. Trump also launched a missile attack against the western Shayrat airbase last April as a direct response to a chemical attack that occurred days earlier. The U.S. Central Command afterward said the 58 of the 59 missiles launched hit their targets and destroyed "aircraft, hardened aircraft shelters, petroleum and logistical storage" as well as ammunition supply bunkers and radar. The base remained operational afterward and critics attributed that fact to the relatively low number of missiles the U.S. launched and Trump’s decision to warn Russia prior to the strike. Pollack, for instance, regards last year's missile attack as a failure because it did not change the dynamic in the civil war or fulfill any strategic U.S. objective. "I don't code that as a success, I code that as a failure, and that's why we're right back where we are again." Trump's national security team are now looking at targets that would have more of an impact without escalating tensions with Russia to the point where it starts a full-blown war. "The bigger question is what is the U.S. seeking to accomplish by lobbing a bunch of missiles—it has to be more than just defending American credibility," he said. "Both Obama's and Trump's policy has been utterly nonsensical." Pollack said he led a "mini wargame" last year involving current and former policymakers in which they contemplated another Syrian missile strike. He said no one could come up with a really good U.S. military operation that would change the course of Syria's bloody seven-year civil war. "One said maybe we could hit two air bases and the other three air bases," he said. Both felt unsatisfactory to him, he said because lobbing "a bunch of cruise missiles" when something "awful happens" cannot be a substitute for actual policy. Trump, with new national security adviser John Bolton's help, needs to devise a long-term strategy for Syria that outlines specific U.S. objectives, he said. President Obama could have had a far easier time making an impact with air strikes back in 2014 before the Russians got involved and greatly upgraded Syria’s air defense systems. Before the Russian upgrade, the Syrian military was notoriously bad about doing regular maintenance on old equipment and the mountainous areas of the country often masked aircraft entering Syrian airspace. "Since 2015 and the Russian intervention in Syria, mounting American strikes on the Syrian regime has become infinitely more complex both from a military-technical perspective and from a diplomatic strategic perspective," Pollack said. This entry was posted in National Security and tagged Russia, Syria. Bookmark the permalink.